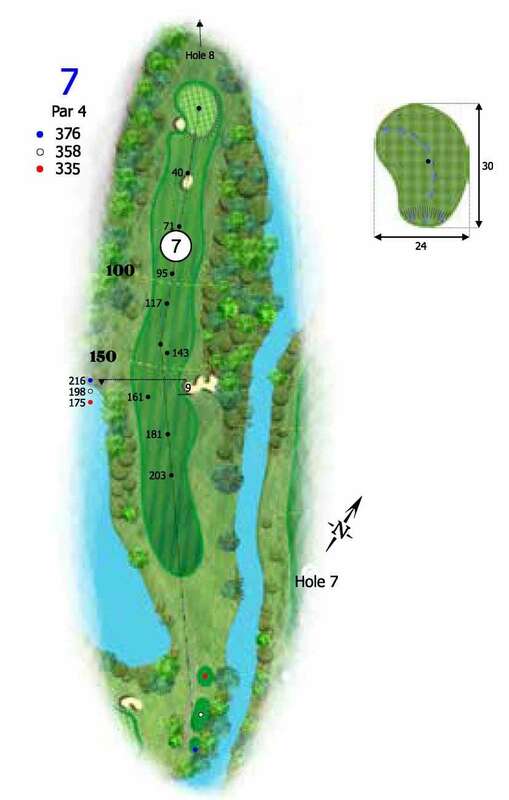 The seventh hole is a good strong par 4. Fairway bunkers and water up the right force you to play out to the left. It is important to be straight off the tee setting up your approach shot to a raised green that is flagged with bunkers to the left and front of the green. Safe Play: Play down the left of this tough par 4 with a long iron or utility wood, when approaching the green note that the green slopes front to back and your ball will run out more than normal. Aggressive Play: Hitting a very accurate driver over the left edge of the fairway bunker will leave you only a short iron or wedge for your second shot, setting up a good chance at birdie.